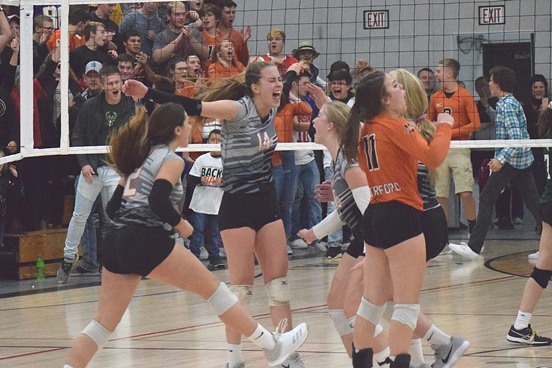 NEILLSVILLE – The Stratford volleyball team had its hands full with a resilient Fall Creek squad, but in the end the Tigers prevailed and now stand one win away from a return trip to the state tournament. Stratford won 3-1 by scores of 25-16, 25-21, 22-25, 25-21, in a WIAA Division 3 sectional semifinal Thursday night at the Neillsville High School Fieldhouse. Stratford, which is now 42-0 this season, moves on to a sectional final at Neenah St. Mary Catholic on Saturday at 7 p.m. The winner moves on to the 2018 WIAA State Girls Volleyball Tournament at Resch Center in Green Bay on Nov. 1-3. “We have to go back to what we know and play our game,” Stratford coach Brooke Kafka said of the upcoming sectional final. “When nerves set in, we need to revert back and use everything that we have. Stratford cruised through the first set and used a 6-0 run in the middle of the second to take control. Blaire Lindner had two kills and Mazie Nagel had an ace in the run that turned a 6-3 deficit into a 9-6 lead and the Tigers would never trail again in the set. Nagel had six kills in the set as the Tigers held on to win 25-21. The third set saw Fall Creek, with a roster void of any seniors, fight back with its season on the line. Neither team led by more than two points until back-to-back aces by Emily Madden gave the Crickets a 13-9 lead. Stratford kept it close after falling behind by as many as seven on two different occasions. Kills by Lindner and Lauryn Nagel cut Fall Creek’s lead to 21-18, and Stratford later closed to within two at 24-22 on a kill by Mazie Nagel, but the Crickets were able to close out the set 25-22. Kafka said the Tigers were able to rely on their veterans of these tight playoff matches to turn the tide after that loss. The fourth set was hard fought as well with five lead changes before Stratford finally pulled ahead for good midway through. A block kill by Emma Ryan gave Fall Creek a 10-8 advantage, but the Tigers responded by scoring seven of the next nine points to pull ahead 15-12 and never looked back. Two aces by McKenna Krall and a kill by Jadyn Dahlke extended the Tigers lead to 22-15 and Stratford eventually finished off the set and the match on another kill by Mazie Nagel. Mazie Nagel finished with 29 kills, Lauryn Nagel added 15 kills, and setters Jadyn Dahlke and Brooke Petersen served up 32 and 26 assists, respectively. Krall topped the Tigers’ defense with 14 digs.